Non-invasive tests have been constructed and evaluated mainly for binary diagnoses such as significant fibrosis. Recently, detailed fibrosis classifications for several non-invasive tests have been developed, but their accuracy has not been thoroughly evaluated in comparison to liver biopsy, especially in clinical practice and for Fibroscan. 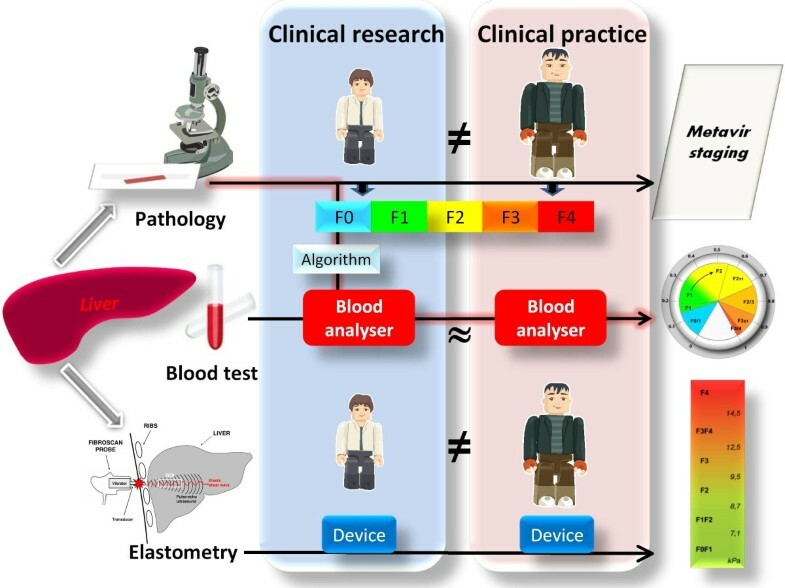 Therefore, the main aim of the present study was to evaluate the accuracy of detailed fibrosis classifications available for non-invasive tests and liver biopsy. The secondary aim was to validate these accuracies in independent populations. Four HCV populations provided 2,068 patients with liver biopsy, four different pathologist skill-levels and non-invasive tests. Results were expressed as percentages of correctly classified patients. In population #1 including 205 patients and comparing liver biopsy (reference: consensus reading by two experts) and blood tests, Metavir fibrosis (FM) stage accuracy was 64.4% in local pathologists vs. 82.2% (p < 10-3) in single expert pathologist. Significant discrepancy (≥ 2FM vs reference histological result) rates were: Fibrotest: 17.2%, FibroMeter2G: 5.6%, local pathologists: 4.9%, FibroMeter3G: 0.5%, expert pathologist: 0% (p < 10-3). In population #2 including 1,056 patients and comparing blood tests, the discrepancy scores, taking into account the error magnitude, of detailed fibrosis classification were significantly different between FibroMeter2G (0.30 ± 0.55) and FibroMeter3G (0.14 ± 0.37, p < 10-3) or Fibrotest (0.84 ± 0.80, p < 10-3). In population #3 (and #4) including 458 (359) patients and comparing blood tests and Fibroscan, accuracies of detailed fibrosis classification were, respectively: Fibrotest: 42.5% (33.5%), Fibroscan: 64.9% (50.7%), FibroMeter2G: 68.7% (68.2%), FibroMeter3G: 77.1% (83.4%), p < 10-3 (p < 10-3). Significant discrepancy (≥ 2 FM) rates were, respectively: Fibrotest: 21.3% (22.2%), Fibroscan: 12.9% (12.3%), FibroMeter2G: 5.7% (6.0%), FibroMeter3G: 0.9% (0.9%), p < 10-3 (p < 10-3). The accuracy in detailed fibrosis classification of the best-performing blood test outperforms liver biopsy read by a local pathologist, i.e., in clinical practice; however, the classification precision is apparently lesser. This detailed classification accuracy is much lower than that of significant fibrosis with Fibroscan and even Fibrotest but higher with FibroMeter3G. FibroMeter classification accuracy was significantly higher than those of other non-invasive tests. Finally, for hepatitis C evaluation in clinical practice, fibrosis degree can be evaluated using an accurate blood test. Whatever the diagnostic means, liver fibrosis is usually described in a synthetic, ordered manner, e.g., fibrosis classification. The development of histological classifications, i.e., Metavir fibrosis (FM)  or Ishak  semi-quantitative staging systems, was an initial step in this field. These histological classifications permitted the development of several non-invasive tests for the diagnosis of liver fibrosis, mainly due to hepatitis C virus (HCV). For statistical reasons, these tests were constructed for binary diagnoses such as significant fibrosis (i.e., bridging fibrosis) and included two classes of fibrosis stages (for example, FM0/1 vs. FM2/3/4). However, these broad classifications are less precise than the original histological classification. The prognostic interest of detailed fibrosis classification has been demonstrated . Therefore, more detailed classifications reflecting histological fibrosis stages were derived from fibrosis test results. Several types of fibrosis classifications are now available for non-invasive fibrosis tests, the most important of which is detailed fibrosis class classification. We developed a fibrosis class classification method specific to FibroMeter that defines six fibrosis classes based on FM classification . Fibrotest and Fibroscan are the other tests with detailed fibrosis class classifications, but methodology details are lacking [5, 6]. Fibrosis class classification is used in the commercial versions of these tests, especially Fibrotest and FibroMeter. Clinicians also use a simplified classification for Fibroscan . However, the diagnostic characteristics, especially accuracy, of these classifications have not been thoroughly evaluated or validated. We recently performed a preliminary simple comparison in one population that suggested a large difference between two blood tests . These non-invasive tests are used in clinical practice. In a previous study, we observed a poor agreement for liver biopsy by local pathologist compared to expert pathologist in clinical practice . However, the accuracy of pathologists for fibrosis classification has never been compared with that of non-invasive tests in this setting. Therefore, the main aim of the present study was to thoroughly evaluate the accuracies of the detailed fibrosis class classifications that have been developed for non-invasive fibrosis tests in patients with chronic HCV hepatitis based on liver biopsy as reference. The secondary aims were to compare these classification accuracies to that of histological staging by liver biopsy measured in clinical practice and to that of binary classification for significant fibrosis, which is the usual accuracy assessment of non-invasive tests. Finally, we evaluated the robustness of these accuracies in independent HCV populations. We recruited different populations with liver biopsy to evaluate the different diagnostic means. Thus, population #1 provided different pathologist skill-levels and blood tests. The large population #2 included only blood tests. The more recent populations #3 and #4 included Fibroscan and blood tests. The four populations were separately analysed due to initial differences in study designs; this allowed us to evaluate accuracy robustness given these differences. Patients with chronic HCV hepatitis, liver biopsy, blood tests and available Fibroscan were consecutively recruited in different populations: #1 to #4 described in Table 1. Each population had different characteristics and fibrosis assessments. Inclusion and exclusion criteria are detailed in previous publications or below for new populations. Briefly, patients did not receive antiviral or known anti-fibrotic treatments. Liver biopsy, blood withdrawal and Fibroscan, when available, were performed within a maximum interval of 6 months. The study protocol conformed to the ethical guidelines of the current Declaration of Helsinki and was approved by local ethics committees. Patients gave written consent. Main characteristics of HCV populations. Population #1 included 205 patients recruited from primary, secondary or tertiary care centres as detailed elsewhere  for a diagnostic study. Liver biopsy was read initially by a local (first line) pathologist, then independently by an expert from the Metavir group and finally by two other experts with a consensus reading in case of disagreement. Population #2 included 1,056 patients provided by five centres participating in the Sniff 17 study . Thus, individual patient data were available from five centres, independent for study design, patient recruitment, and blood marker determination. Blood and pathological determinations were not centralized. Pathological assessments were performed twice by the same pathologist in Grenoble, once in Bordeaux and once each by two pathologists in Angers, Tours and PACA region, with a common final reading in cases of disagreement. Population #3 included 458 patients provided by 19 centres participating in the Fibrostar study . Blood determination and liver interpretation were centralized. Liver specimens were read by two senior experts, one of whom was from the Metavir group. Population #4 included 349 patients provided by three centres participating in the Vindiag 7 study (exploratory set) . Blood and pathological (one senior expert in each centre) determinations were not centralized. Fibrosis was staged in liver biopsy according to Metavir staging  in all patients. This fibrosis stage classification was used as the reference for the calculation of accuracy. In population #1, where several readings were available, the consensus reading by two experts was the reference. "Expert pathologist" was defined as a senior pathologist specialized in hepatology. At least one expert pathologist was available in each study. Blood tests were determined in all studies; we only evaluated here those for which a detailed fibrosis class classification has been described, i.e., FibroMeter  (Biolivescale, Angers, France) and Fibrotest  (Biopredictive, Paris, France). Second generation FibroMeter (FibroMeter2G) , the most widely studied, and a recent third generation FibroMeter (FibroMeter3G)  were evaluated. Two studies also included Fibroscan (Echosens, Paris, France) as this technique has only been available since 2004; usual technical aspects have been described elsewhere . All successful measurements of Fibroscan were included in the calculations. The histological fibrosis stage classification into 5 FM stages (Figure 1a), as determined on a liver specimen by a pathologist. This was the reference for accuracy. Summary of different available fibrosis classifications in population #2. 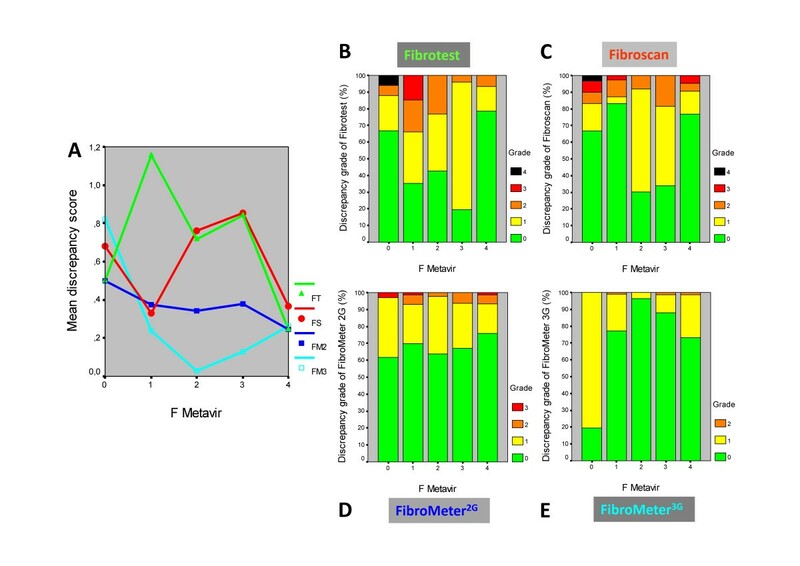 Metavir stages by liver biopsy (A), significant fibrosis by FibroMeter2G (FM) (B), fibrosis class classification by FibroMeter2G (C) or FibroMeter3G (D) or by Fibrotest (FT) (E). The central figure within the pie chart indicates the number of fibrosis classes. Sectors correspond to patient proportions. The figures in the external circle of panels reflect the values of blood test scores. FM denotes the Metavir fibrosis stages estimated by the classification. The binary diagnosis of significant fibrosis (2 classes, Figure 1b) determined either on liver specimen or by the diagnostic cut-off in non-invasive tests. This is the usual diagnostic target of non-invasive tests and thus served as a comparator for the detailed classifications. Indeed, as it was expected that a more detailed classification would result in decreased accuracy, this binary accuracy allowed for the evaluation of the putative accuracy loss. The classifications previously published for blood tests and Fibroscan. There are 6 classes for FibroMeter2G (Figure 1c) , 7 for FibroMeter3G (Figure 1d), 8 for Fibrotest (Figure 1e)  and 6 for Fibroscan . 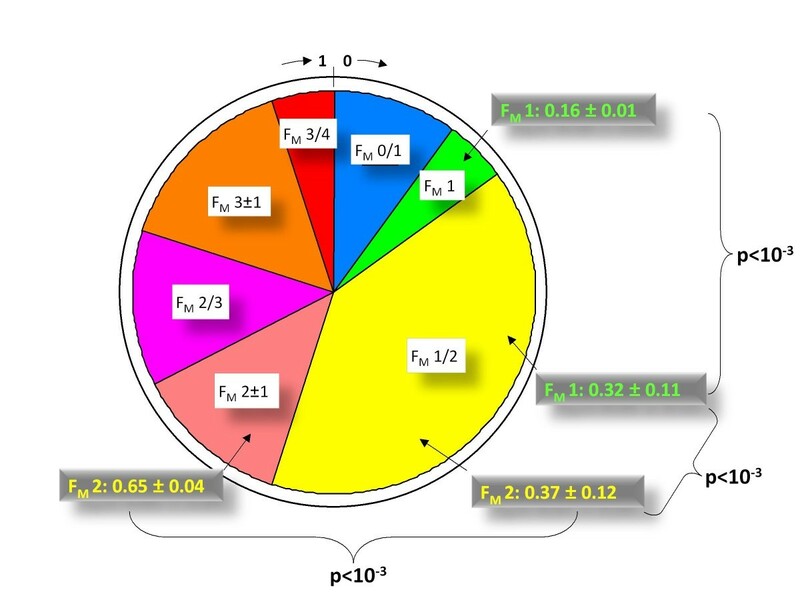 The methodology for the development of FibroMeter2G classification has been published : briefly, the percentiles of blood test values were segmented into different intervals according to an absolute majority probability (p ≥ 0.75) for one or several FM stages (their number had to be ≤ 3). We developed an improved fibrosis class classification for FibroMeter3G by using specific thresholds and changing slightly the fibrosis classes (Figure 1d). The optimization consisted in obtaining the best accuracy/precision ratio (number of Metavir fibrosis stages per fibrosis class of the non-invasive test). The classifications derived from the cumulated cut-offs calculated for different binary diagnostic targets, usually significant fibrosis and cirrhosis. Physicians normally use these kinds of classifications for the interpretation of Fibroscan results. This process results in a classification including 3 classes: FM0/1, FM2/3, and FM4. The cut-off for severe fibrosis (FM≥ 3) may also be used, resulting in a classification with 4 classes: FM0/1, FM2, FM3, and FM4. We used the diagnostic cut-offs calculated for HCV in the meta-analysis of Stebbing et al, giving the following three classes: < 8.44 kPa: FM0/1, ≥ 8.44 kPa and < 16.14 kPa: FM2/3, ≥ 16.14 kPa: FM4. Data were reported according to STARD statements . Quantitative variables were expressed as mean ± SD, unless otherwise specified. Metavir fibrosis staging was used either as a categorical variable or as a score (continuous variable) since we have shown a perfect linear correlation between Metavir fibrosis stages and fractal dimension of fibrosis which reflects quantitative architecture. For this reason, the results of fibrosis class classification were also evaluated as a score, e.g., FM3/4 class was noted as 3.5. This score was only used in the reflection evaluation of Metavir staging (see the fourth figure). Multivariate analyses were based on binary logistic regression. The performance of each test was mainly expressed by the accuracy (i.e., true positives and negatives or correct classification). The diagnostic cut-offs used for significant fibrosis were determined by a posteriori maximum Youden index (sensitivity + specificity - 1). Discrepancy between diagnostic means can be evaluated as grade or score. The grade rate shows details, especially the grade of significant discrepancy (≥ 2 FM stages). The discrepancy score took into account the magnitude of the error. This score was defined as follows: 0 for correct classification, then 1, 2, 3 or 4 as per the misclassification in FM stages between the liver specimen and the fibrosis class classification by the non-invasive test. For example, a patient with histological FM4 but classified as FM0/1 by blood test was scored 3. The mean score permits a comparison between blood tests. A low score means a low discrepancy magnitude. Statistical software programs were SPSS version 17.0 (SPSS Inc., Chicago, IL, USA) and SAS 9.1 (SAS Institute Inc., Cary, NC, USA). Population #1 was used to compare the accuracy of pathologists with different expertise levels or vs. blood tests. The prevalence of significant fibrosis was 49.3%. Metavir expert as reference - The rates of correct classification for significant fibrosis and FM stages by local pathologists were, respectively: 77.1% and 52.2% (p < 10-3 by McNemar test). Consensus reading as reference - The rates of correct classification of the two single (local or expert) pathologists and two blood tests are listed in Table 2. Briefly, detailed fibrosis classifications could be ordered according to their accuracies as follows: FibroMeter3G (89.0%) ≈ expert pathologist (82.2%) ≈ FibroMeter2G (76.3%) > local pathologists (64.4%) > Fibrotest (34.3%). FibroMeter2G was the only diagnostic method with no significant difference in correct classification rates between significant fibrosis diagnosis and fibrosis class classification. FibroMeter3G was the only diagnostic method with a significant increase in correct classification rate of fibrosis class classification compared to significant fibrosis diagnosis. Rates of correct classification (%, bold characters) as a function of diagnostic means in population #1. The reference is consensus reading of liver biopsy. The discrepancy scores were significantly different between pathologists: local vs. expert: 0.55 ± 0.63, local vs. consensus: 0.40 ± 0.58, expert vs. consensus: 0.17 ± 0.38 (p < 10-3 by paired Friedman test). In addition, the proportions of significant discrepancies (≥ 2 FM stages) were significantly different: local vs. expert: 7.3%, local vs. consensus: 4.9%, expert vs. consensus: 0% (p < 10-3 by paired Cochran test). When considering consensus reading by experts as reference, the discrepancy score of FibroMeter2G was significantly lower than that of local pathologists (p = 0.043) but significantly higher than that of the expert pathologist (p = 0.006, Table 3). This latter was not significantly different from that of FibroMeter3G (p = 0.077). The discrepancy score of Fibrotest was significantly higher than that of local or expert pathologists (p < 10-3). In addition, the proportions of significant discrepancies were very different: FibroMeter3G < FibroMeter2G < Fibrotest (p < 10-3 by paired Cochran test, Table 3). Discrepancy against a diagnostic reference. Discrepancy score and significant discrepancies (≥ 2 FM stages) with liver biopsy results as a function of fibrosis classifications by pathologists, blood tests or Fibroscan according to the 4 populations. Results are detailed in population #2 since it was the largest (1,056 patients) for blood tests. The accuracy of fibrosis class classification by FibroMeter2G, FibroMeter3G and Fibrotest have been presented elsewhere  and will discussed further on. The discrepancy scores were significantly different between FibroMeter2G and FibroMeter3G (p < 10-3) or Fibrotest (p < 10-3, Table 3). Details on discrepancy grade are shown in Figure 2. In addition, the proportion of significant discrepancies with FibroMeter2G or FibroMeter3G was significantly lower than with Fibrotest (p < 10-3 by McNemar test, Table 3). Rates of discrepancy grade of fibrosis class classifications by diagnostic tests in populations #2 (top) or #3 (bottom). The figure indicates the difference in the number of fibrosis stage(s) between the blood test and liver biopsy. Thus, the grade 0 (green pie sector) indicates agreement with liver biopsy. Populations #3 and #4 were used to compare elastometry by Fibroscan and blood tests. In population #3 (and #4), the accuracies of the fibrosis class classifications were 42.5% (33.5%) for Fibrotest, 64.9% (50.7%) for Fibroscan, 68.7% (68.2%) for FibroMeter2G, and 77.1% (83.4%) for FibroMeter3G, p < 10-3 (p < 10-3) between non-invasive tests (Table 4). Rates of correct classification by non-invasive means (%, bold characters) as a function of fibrosis classification in populations #3 and #4. 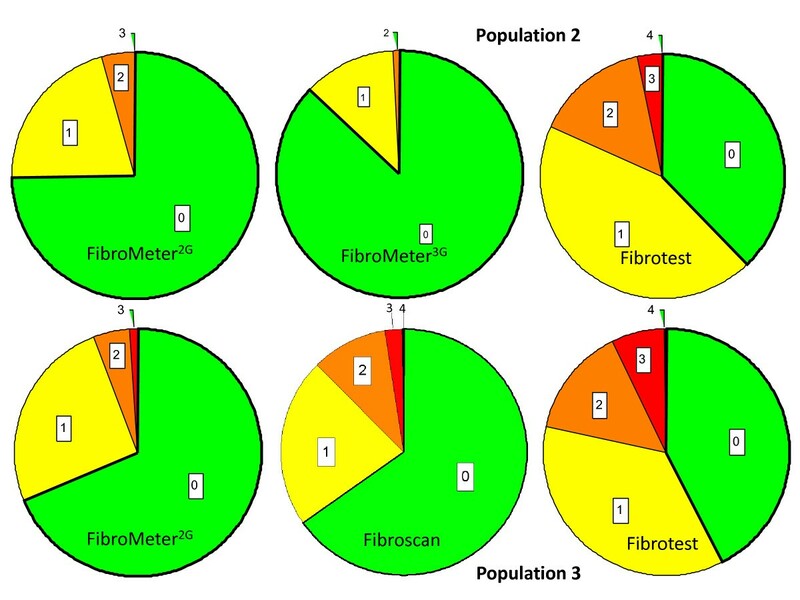 In population #3 and #4, the discrepancy scores were significantly different: FibroMeter3G < FibroMeter2G < Fibroscan < Fibrotest (p < 10-3 by Friedman test in each population, Table 3), with only FibroMeter2G offering a homogeneous score among FM stages (Figure 3). Details on discrepancy grade are shown in Figure 2. The proportions of significant discrepancies were also significantly different among fibrosis tests (p < 10-3 by Cochran test in each population, Table 3). Discrepancy between fibrosis class classifications by non-invasive tests and liver biopsy staging. Results (Y axis) are expressed as a function of Metavir fibrosis (F) stage (X axis) in population #3. The left panel A indicates the mean score. The right panels show the details of discrepancy grades for each diagnostic test: Fibrotest (B), Fibroscan (C), FibroMeter2G (D) and FibroMeter3G (E). The grade indicates the difference in the number of fibrosis stage(s) between the blood test and liver biopsy. FT: Fibrotest, FS: Fibroscan, FM2: FibroMeter2G, FM3: FibroMeter3G. In population #2, the fibrosis class classification of FibroMeter2G (expressed as score) was more closely correlated with FM score than that of Fibrotest (Figure 4a/b). By ANOVA, the mean FM score was significantly different as a function of fibrosis class classification of FibroMeter2G (F = 188, p < 10-4) and Fibrotest (F = 83, p < 10-4). However, the post hoc comparison (by weighted Bonferroni test) showed highly significant differences between each pair of fibrosis classes for FibroMeter2G, whereas this was not observed between several pairs of contiguous classes of Fibrotest (Figure 4a/b). Mean Metavir fibrosis score as a function of Metavir-based fibrosis class classifications. Results (± standard deviation, Y axis) are expressed as a function of classifications (X axis) for: FibroMeter2G (panels A and C, 6 classes), Fibrotest (panels B and D, 8 classes) or Fibroscan (panel E, 6 classes) in populations #2 (top) or #3 (bottom). P by weighted Bonferroni test. The global relationship is indicated by Spearman's correlation coefficient (rs). 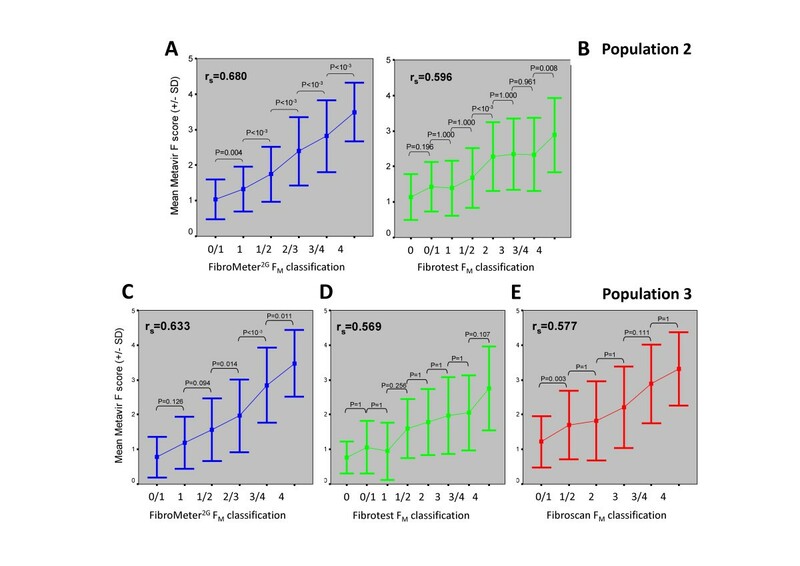 Results in population #3 were similar to those observed in population #2: significant discrimination between most contiguous fibrosis classes by FibroMeter2G and any significant discrimination by Fibrotest (Figure 4c/d). Fibroscan classification was poorly discriminating between contiguous classes (Figure 4e). The fibrosis class classification might offer some degree of imprecision in the classes including at least two FM stages. Therefore, we evaluated the meaning of test score within the largest class observed, i.e., FM1/2 class with FibroMeter3G in population #2 (Figure 5). In this class, FibroMeter3G score was 0.32 ± 0.11 in FM1 vs. 0.37 ± 0.12 in FM2 (p < 10-3). 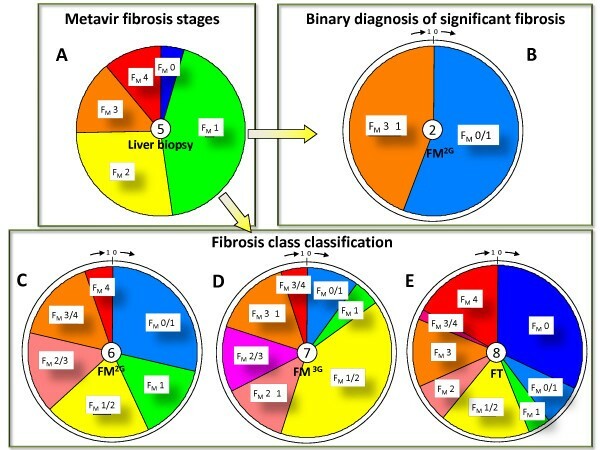 Meaning of blood test score (in grey rectangles) in different Metavir fibrosis (F M ) stages within the same class of fibrosis class classification. Example of FM2 and FM1 stages in FibroMeter3G in population #2. Sectors correspond to patient proportions. The figures on the top of the external circle reflect the values (mean ± SD) of the blood test score for a single FM stage. The significant difference between FM stages of contiguous classes was mathematically expected contrary to that observed within a single class. In this study, we have shown that the fibrosis class classification of an accurate blood test like FibroMeter2G provides better accuracy than Metavir staging by local pathologists, which reflects clinical practice. Additionally, its accuracy was not significantly different from that of Metavir staging by a senior expert of the Metavir group. Surprisingly, fibrosis class classification of FibroMeter3G provided a non-significantly higher accuracy than that of the senior expert of the Metavir group. This can be attributed to the poor inter-observer agreement of liver interpretation for fibrosis staging in clinical practice . These results nonetheless deserve some comments. First, the accuracy of liver biopsy was significantly superior to that of the best performing non-invasive test when the diagnostic target was binary, such as significant fibrosis. In other words, the development of detailed fibrosis class classifications derived from FM stages compensated for the lesser performance of non-invasive tests in binary diagnostic targets, as observed in the literature and in the present study. Second, fibrosis class classifications of non-invasive tests seem less precise at first glance; we discuss this important characteristic further on. Third, this study underlines the issue of reference, as an expert from the Metavir group underperformed the consensus reading considered as reference in the present study. Thus, who, or what, should be used as a reference? We have already observed that a consensus reading improved reproducibility and thus could be considered as a reference . However, we do not know if a panel reading would be a more reliable reference. Liver biopsy does have innate limits, such as sampling error and sample size effect, which surpass those of liver interpretation. Indeed, two studies have recently shown that blood tests for liver fibrosis were better prognosis predictors than histological staging [17, 18]. Liver biopsy was used as the best standard . Despite its limits, it can be considered as a good reference for the comparison between non-invasive tests since there are no data to consider that the biopsy error was not systematic (i.e., different between tests). In other words, the accuracy of non-invasive tests is probably underestimated but not their comparison. The results of the different populations are summarized in table 5. The accuracies of fibrosis class classifications were different among non-invasive tests in the present study in the following order: FibroMeter3G > FibroMeter2G > Fibroscan > Fibrotest. It should be underlined that these differences were observed in several independent populations. In addition, from one study to another, the rank of accuracy between tests was very reproducible. Thus, the present results are robust. It should also be noted that the authors of a recent study using a quite different methodology in a small series (four patients) observed an accuracy of less than 25% with the fibrosis stage classification of Fibrotest . How thus can one explain this apparent discrepancy between the close accuracies of non-invasive tests for the usual binary diagnostic targets such as significant fibrosis, and the dissimilar accuracies in their fibrosis class classifications? First, a single binary diagnostic target necessarily (mathematically) includes fewer sources of errors than a multiple-stage classification. Second, the statistical methods used to develop the fibrosis class classifications have to be considered. We developed a new statistical method for the development of a fibrosis class classification . Thus, we obtained a fibrosis class classification with FibroMeter2G that included 6 classes, each one comprising only one or two Metavir fibrosis stage(s). It should be noted that the fibrosis class classifications of Fibrotest or Fibroscan have been reported but the statistical methodology used to establish them was not described [5, 6], nor their accuracy. The method used for three stage classification of Fibroscan accumulates the misclassification rates of each diagnostic cut-off. We used the cut-offs of Stebbing et al since their study was a large recent meta-analysis restricted to HCV. The method of fibrosis class classification that we developed for FibroMeter2G  was validated in the present study by the reproducible accuracy measured in several independent large populations. Thus, before using a non-invasive test in clinical practice, it seems important to verify the statistical methodology behind the construct and its accuracy. Summary of correct classification rates (%) and score/grade discrepancy (2 bottom lines). Results are presented according to different classifications and diagnostic means in the 4 populations with hepatitis C.
The present results indicate that the FibroMeter classification is robust, as its precision was expanded from 2 for significant fibrosis to 6 or 7 fibrosis classes at the expense of only a 4% relative decrease in FibroMeter2G accuracy or a 12% relative increase in FibroMeter3G accuracy (87% in the largest series) . It should be noted that the accuracy/precision ratio was optimized only for FibroMeter3G  but this optimization could also be applied to FibroMeter2G. This contrasts with Fibrotest, which displayed a 49% relative decrease in accuracy in the largest series between the binary diagnosis and its 8-class fibrosis classification . In addition, the FibroMeter2G fibrosis class classification was more discriminant than those of Fibrotest or Fibroscan in distinguishing fibrosis classes, especially two successive classes (Figure 4). It has been suggested that the maximal theoretical accuracy may be around 90%, considering the limits of liver biopsy as a reference . The discrepancy level between fibrosis class classifications of non-invasive tests and Metavir stages was reflected by the discrepancy score and the proportion of significant discrepancy (≥ 2 FM), which markedly varied among tests in the present study. FibroMeter2G and even FibroMeter3G provided a significantly lower discrepancy score than Fibrotest or Fibroscan in all study populations. The accuracy (correct classification in the whole population) of binary diagnosis was superior or equal to that of fibrosis class classification except for FibroMeter3G. However, the level of classification precision (less fibrosis stages per class) also has to be examined. When the ratio between accuracy and precision is considered, fibrosis class classification seems to provide the best performance. Finally, the fibrosis class classification of FibroMeter2G had a significantly higher correct classification (qualitative accuracy descriptor) and a significantly lower discrepancy level (quantitative accuracy descriptor better reflecting disagreement than the former) compared to local pathologists. In addition, FibroMeter3G compared favourably with expert pathologist for those characteristics. This better accuracy for the fibrosis class classification of FibroMeters as compared to liver biopsy would seem to provide a strong argument for their use in clinical practice despite their lesser precision. In other words, FibroMeters had fewer errors than liver biopsy interpretation in clinical practice. Figure 6 also shows that a blood test has a robust diagnostic reproducibility in clinical practice, compared to other diagnostic means. However, this issue of precision can be refined. Schematic reliability of diagnostic means. In clinical practice, a blood test is more reliable than liver pathology since the blood test is based on an algorithm that was calculated with expert pathologist as reference (black arrow with red background). There is little procedure variability for blood tests due to excellent interlaboratory reproducibility, contrary to the large inter-observer disagreement for liver pathology and, to a lesser degree, for elastometry. The size of observers is proportional to published observer variability. Based on FM stages, fibrosis class classifications provide multiple classes of FM stages according to blood test values . Thus, FibroMeter2G fibrosis class classification provided the following new classes: FM0/1, FM1, FM1/2, FM2/3, FM3/4 and FM4. These correspond to the following FibroMeter fibrosis stages expressed in single Metavir score: FM0.5, FM1, FM1.5, FM2.5, FM3.5, and FM4. They can furthermore be translated into the following new FibroMeter2G fibrosis (FFM) stages: FFM0, FFM1, FFM2, FFM3, FFM4 and FFM5. This last classification assumes that there is less error with non-invasive tests than with liver biopsy, as suggested by several studies [22, 23]. Therefore, the interest of these new classifications, based on "blood" fibrosis stages, has to be tested independently of their native histological reference by using clinical events as an endpoint. This could be accomplished through a prognostic study as previously done for blood tests used as scores [17, 18] from which classifications are derived. Finally, it should be noted that within the largest FibroMeter3G fibrosis class, the score progression of blood test well reflected the histological progression (Figure 5). The prevalence of significant fibrosis in the four populations was close to that (48%) of a reference population of 33,121 patients with HCV and liver biopsy . The studies including Fibroscan were not based on an intention-to-diagnose analysis since unsuccessful measurements were not included. This would decrease the accuracy by about 5% as already shown in another study  but not modify the hierarchy of tests regarding accuracy. It should be underlined that liver biopsy has other indications than liver fibrosis. Liver biopsy is useful for fibrosis staging if the reading is performed by an expert, or even better, by consensus including preferably at least one expert. Accuracies varied very significantly between the fibrosis class classifications of the non-invasive tests. With the best performing test, this classification has two advantages: increased precision and accuracy compared to a binary diagnosis of significant fibrosis; and similar or higher accuracy when compared to histological staging performed in clinical practice conditions. However, the accuracy/precision ratio was higher with Metavir staging by definition, since this was the reference. These results, observed in hepatitis C, should be evaluated in other causes (see Additional File 1). Finally, the classification of a good-performing test permits the evaluation of the degree of fibrosis in settings where liver biopsy is not available or feasible, such as in epidemiological studies. Ph. Halfon, M. Bourlière, D. Ouzan, A. Tran, D. Botta, Ch. Renou, Ch. Sattonnet, M-C. Saint-Paul, Th. Benderitter, S. Garcia, H-P. Bonneau, G. Penaranda; Tours: Y.Bacq, A. de Muret, M-C. Bréchot; Grenoble: V. Leroy, N. Sturm, M-N. Hilleret, P. Faure, J-C. Renversez, F. Morel, C. Trocme; Bordeaux: V. de Ledinghen, J. Foucher, L. Castera, P. Couzigou, P-H. Bernard, W. Merrouche, P. Bioulac-Sage, B. Le Bail; and Clichy: C. Degott, V. Paradis. Hepatologists: R. Poupon, A. Poujol, Saint-Antoine, Paris; A. Abergel, Clermont-Ferrand; J.P. Bronowicki, Nancy; J.P. Vinel, S. Metivier, Toulouse; V. De Ledinghen, Bordeaux; O. Goria, Rouen; M. Maynard-Muet, C. Trepo, Lyon; Ph. Mathurin, Lille; D. Guyader, H. Danielou, Rennes; O. Rogeaux, Chambéry; S. Pol, Ph. Sogni, Cochin, Paris; A. Tran, Nice; P. Calès, Angers; P. Marcellin, T. Asselah, Clichy; M. Bourlière, V. Oulès, Saint Joseph, Marseille; D. Larrey, Montpellier; F. Habersetzer, Strasbourg; M. Beaugrand, Bondy; V Leroy, MN Hilleret, Grenoble. Biologists: R-C. Boisson, Lyon Sud; M-C. Gelineau, B. Poggi, Hôtel Dieu, Lyon; J-C. Renversez, Candice Trocmé, Grenoble; J. Guéchot, R. Lasnier, M. Vaubourdolle, Paris; H. Voitot, Beaujon, Paris; A. Vassault, Necker, Paris; A. Rosenthal-Allieri, Nice; A. Lavoinne, F. Ziegler, Rouen; M. Bartoli, C. Lebrun, Chambéry; A. Myara, Paris Saint-Joseph; F. Guerber, A. Pottier, Elibio, Vizille. Pathologists: E-S. Zafrani, Créteil; N. Sturm, Grenoble. We also thank the following contributors: Gilles Hunault, Pascal Veillon, Gwénaëlle Soulard; and Kevin L. Erwin (for English proofreading). PHRC (clinical research funding program) of the French Department of Health for SNIFF 17 in 1994 and 2002, ANRS (French national agency for AIDS and Viral Hepatitis) for HC EP 23 Fibrostar. Paul Calès, Isabelle Fouchard Hubert and Frédéric Oberti have stock ownership in BioLiveScale Inc. BioLiveScale has a license for FibroMeter from Angers University. Other authors: no conflicts of interest to declare.